Forty years ago Australia decided to engage China. We should now embark on a similar path of engagement with Africa. Africa is on a growth trajectory that’s enabled it to become the world’s fastest-growing continent. 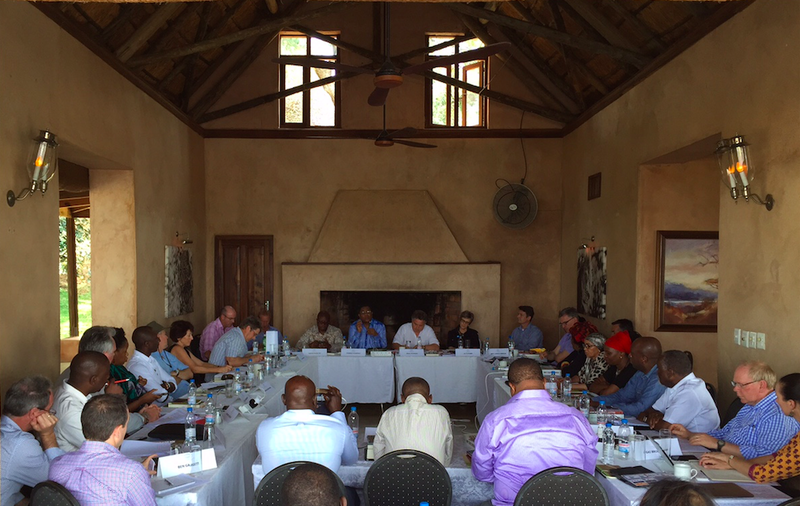 I recently returned from Zambia where ASPI teamed with South Africa’s Brenthurst Foundation to convene the second Aus–Africa Leadership Dialogue, after the first iteration in 2013 . Australia and Africa can work together across infrastructure, trade, education and broader security cooperation. There’s been the recent opening of an Australia Africa Chamber of Commerce and the establishment of a Government Advisory Group on Australia–Africa Relations . There’ll be a ‘Doing business in Africa’ conference  in Melbourne next month. We’ve got 200 Australian mining companies involved in over 700 projects in Africa. Our relations with Africa aren’t about aid, they’re about investment, trade and people-to-people links. Africa will have billion people by 2050. We need to change the narrative so we conceive of Africa as a rich continent, and one of opportunity. Unfortunately Africa’s image is one of inefficiency and strife and therefore many think it’s better for Australia to focus on Asia. Let me set out some possible areas of cooperation outside of the security domain, which will be the subject of a separate post. In the area of health, the Ebola outbreak revealed that the World Health Organization needs a deployable, international volunteer medical corps for handling health crises. Australia should be working with Africa to promote a voluntary multinational corps ready on short notice when the next health emergency arises. Australian companies in Africa can assist in future campaigns that focus on basic health and hygiene in the workplace and home. Forty percent  of Africa’s working age population is between 15 and 24. There’s a real need for entrepreneurship amongst youth in Africa. Several of Australia’s higher education institutions have entrepreneurship programs, but Africa has been off their radar. Australian business can work with African researchers on how bigger companies can outsource to smaller companies to get younger people into the value chain. Natural disasters act as a huge handicap on the development of many African countries. Australia can help in operational capacity. In Botswana, for example, the NSW Rural Fire Service has successfully trained fire fighters  and established a coordinated firefighting model in bush fire prone Botswana. We have engineering companies that can assist in developing more resilient infrastructure. In the area of road safety, Africa possesses only 2% of the world’s vehicles but contributes 16% to the global deaths . Australia could be working with African researchers and governments to understand the factors behind these figures. In sports diplomacy we could expand our sporting scholarships and friendly matches to foster good will on the continent. Many African countries have underfunded, but creative entertainment industries. Through our movie makers there’s opportunities to work with Africa to tell some great stories. A memorandum of understanding was recently signed  by our Foreign Ministry and a new body, the Australian Fashion Chamber, a peak body for designers, to promote our creative industries overseas. We could showcase the work of our designers in Africa and work with African designers to open doors to trade and investment. Australian agriculture research and expertise can help improve productivity along food and agriculture chains in Africa. Australia has long confronted drought and water management issues. We know the challenges of producing crops that can withstand the elements. There’s a tremendous opportunity for Australia to export this knowledge  to help build African capacity. Australia can contribute to African diets by applying our business services. Better food packaging, for example, can reduce food waste. In the area of energy security, Australia’s pretty good at publishing our energy resources and plans; we could assist in African energy planning to ensure right long-term transparent investment framework is there. We can share how we develop energy supply chains: from power stations, transport of power to customers, through to the retailers who buy wholesale electricity and package it with transmission and distribution services for sale. The blue economy concept is about marine economic activity as a driver of sustainable growth and development. The African Union has produced 2050 Africa’s Integrated Maritime Strategy . Oceans will become an economic force this century, driven by new technologies that make it economically viable to tap marine resources and demographic trends fueling the search for food security and alternative sources of minerals and energy. Australia’s well placed to advance the blue economy working with Africa. There’s plenty of opportunities for Australia to contribute to the development of the blue economy agenda  (PDF) in Africa, whether it be by providing good data to better manage data-poor fisheries, helping with aquaculture systems, mapping wave-energy resources, and assisting with dredging science for port developments. An Australian company, Carnegie Wave Energy, has just signed a memorandum of understanding with the Seychelles  to investigate wave power and micro-grid opportunities. Much of East Africa’s offshore oil and gas potential is at a depth of around 3500 meters. Australian company Woodside has experience developing gas resources at such depths  (PDF). Australia and Africa should work together to take advantage of the opportunities offered by innovating in the blue economy. Anthony Bergin is deputy director at ASPI. A full report of the second Aus-Africa Dialogue will be published by ASPI and the Brenthurst Foundation. Image (c) Lisa Sharland 2015.